Different approaches to merge 2 or more PST files into one: "Add Files" & "Add Folder"
Replicate data items across various Outlook PST files can cause N numbers of cumbersome problems. PST Merger Software helps to remove duplicate Outlook data file items while performing merging. Just mark the check-box "Remove Duplicates" and click on "Merge PST Files" button. It will automatically start removing the duplicate items which exist across different Outlook Data files. It is counted as the useless sector or the PST file. Merging multiple PST files including deleted items is not more than wasting of Outlook Data File's space. 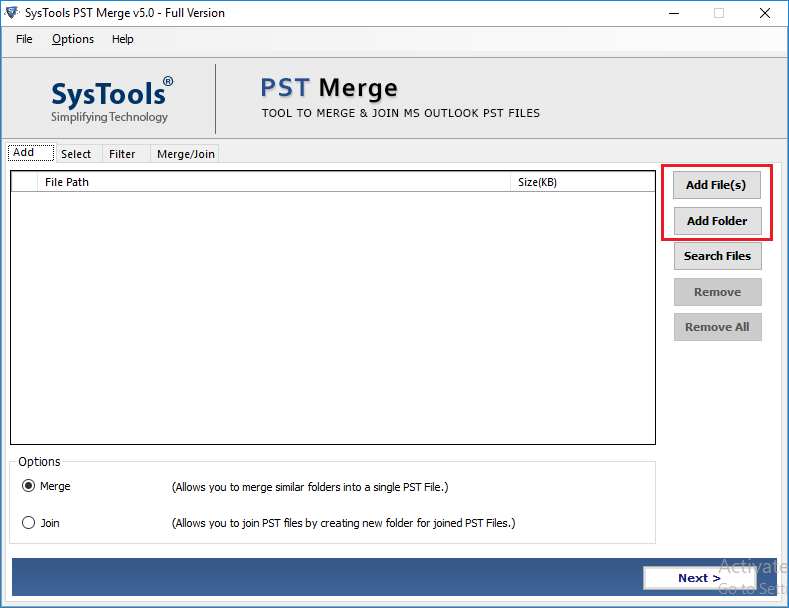 From this perspective, the Outlook PST merge software also offers an option called "Exclude Deleted Items" which can exclude the deleted items of PST files before combining Outlook PST files. User friendly interface of the PST Merger tool is primarily one of the unique contribution of developers which gives more convenient while working with it. The PST file combiner shows the complete status of execution on the screen while performing merging. 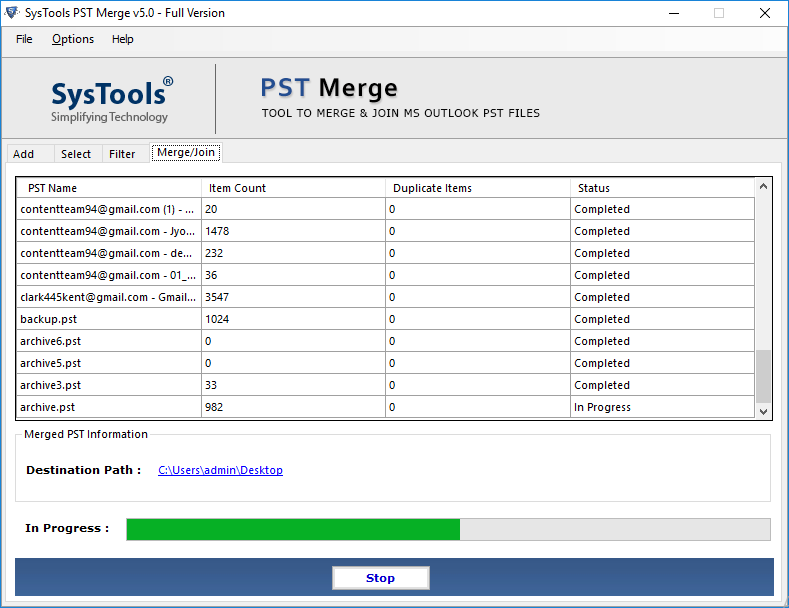 "Current PST Status" and "Overall Status" displays an estimated time that can be taken by the tool for merging PST files or how much data has been processed by the tool. After the completion of the process successfully and clicking on "Ok" button. PST Merge Utitlity roll out next windows screen to show a brief summary of the entire execution process. This report defines the executed numbers of PST files with serial number, PST name, number of duplicate items in each file, total number of items in a PST file and ultimately the status. Add File: To insert several PST files. This option is quite helpful is you are going to add different PST files from the varied location within the machine. Add Folder: This option is a pertinent option in the context of adding an entire folder full of Outlook data files. Its on optimum medium for batch merging of PST files. 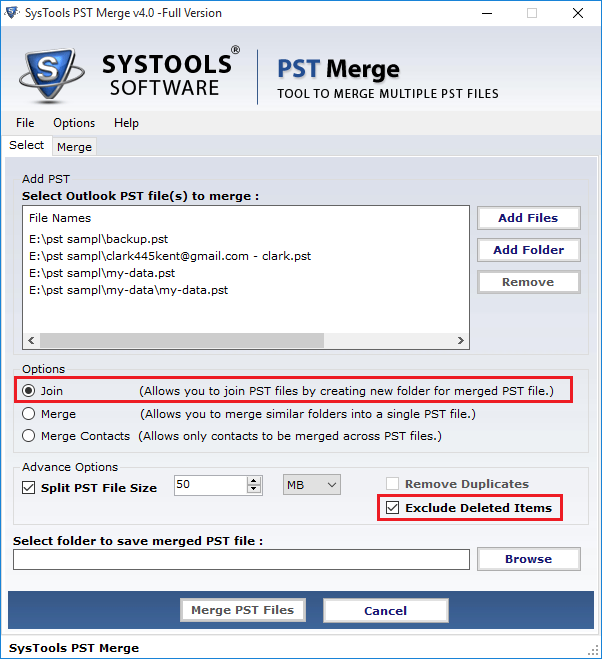 Merge: With this option, an Outlook users can merge multiple PST files into a single Outlook Data file. The newly created file contains all the data of the merged Outlook data file. Contacts: With this option user can easily merge contacts of multiple Outlook PST file into single PST file without losing any data. Outlook PST Merger Software is just not an advanced technology to merge PST files. The Tool has also built up with the concern of the user interface and that makes it more convenient for Outlook users. Each and every section of the merge PST software is self-explanatory, means it's easy to execute the application, even if you are not much aware about the technology. Merge Outlook PST software provides the option to split Outlook data file after the completion of the merging process of Outlook data files. 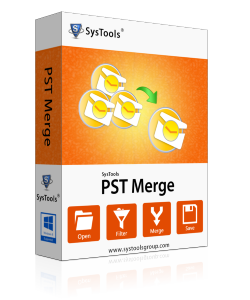 The PST merge software does not loss any data while combining multiple PST file into one. Data remains in same state as it was originally before starting the merging process of Outlook PST files. What is the difference between "Join" and "Merge" option in PST Merge tool? The Join option in the tool will simply generate a PST file that has multiple PST files merged into it. On the other side, the Merge option will unite similar folders into a PST file. For example: For all Inbox folders of selected PST files, a single PST file will be saved and in the same way for all sent items, an individual PST file will be created. Is there any limitation on number of files that can be merged? 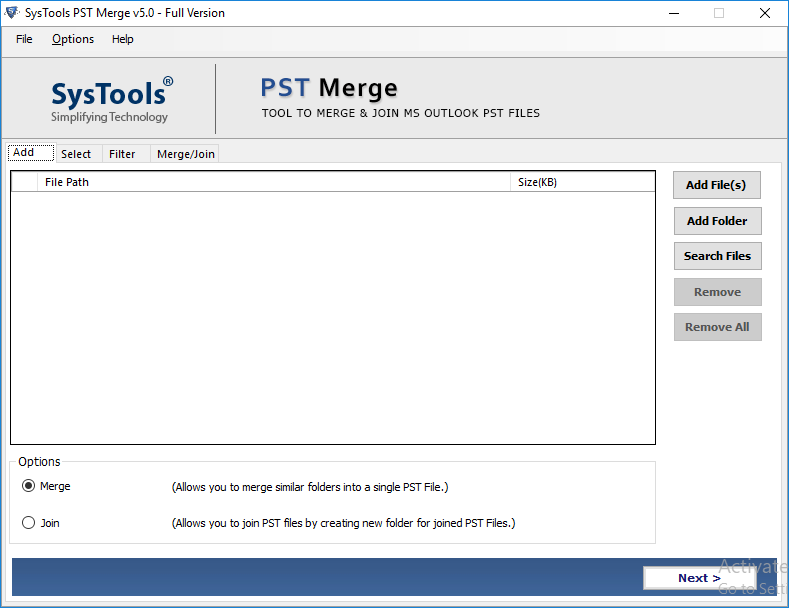 No, PST Merger tool allows adding multiple PST files for merging. There is no limitation to the number of files added to the tool for processing. Is it necessary to install MS Outlook on machine to use the PST Combiner tool? Yes, it is mandatory to install MS Outlook (any version) and configure it with Pop3/dummy profile in order to use the merge pst tool. In absence of Outlook in the system, the PST combiner will revert back an error that says 'Outlook session created error'. I have ANSI formatted PST file. Will the software process them? PST File Merger supports both ANSI and Unicode format of PST file. So if you have ANSI PST files to merge, the software will efficiently perform the job for you. What is the standard time limit for the software to merge PST files? The time taken for the merge process depends upon the size of PST file and the number of files added to the tool for merging. Some of my archive PST files are showing errors on opening. Will the PST merge software work in this state? In this case, it depends upon the type of error. If the error is occurring due to any kind of application dis-balance, then the software will merge PST files for you. However, if the errors are restricting opening of PST file, then you need to first fix the error and then process the files against the tool. What is the 'Add Folder' option in the Outlook 2010 PST File Merger tool? While adding PST files to the tool, users can click on Add Folder option. If the PST files are saved in a specific folder, the software will fetch all PST files from the folder. Step 1 : Free Download PST Merge Software. Step 2 : Add PST Files from local storage. Step 3 : Select Join, Merge PST, Merge Contacts option. Step 4 : Click on Merge PST Files button.